Network Minotaur is a unique Minotaur that serves as an important boss in the Hack the Planet Adventure on Nessus. 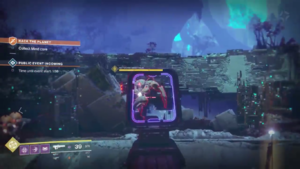 It must be killed to obtain a Vex Mind Core that is needed to access the area where Failsafe is being held hostage by the Network Cyclops. The Network Minotaur will spawn after 100% stabilizing the Confluxes the first time. It will teleport throughout the Watcher's Grave for each health checkpoint. Killing it rewards the Mind Core, allowing the player to advance in the adventure. The Network Minotaur has a similar height of a Gate Lord.